The electric version of a fuel pump is what we call a charging point. One that keeps the charging process to a maximum of 15 minutes is a fast. A device fixed to an electricity grid that physically connects with a counterpart on the bottom of a vehicle in order to transfer up to 20kWh of electricity in less than 15 minutes. To the user it is no more than a disc in the ground. A single object on which he can focus without losing touch for traffic or people. Gentle illumination indicates the FCP's accessibility, while the driver takes a rough aim at the spot. If necessary a visual guide on the car monitor assists for final positioning. From a technical point of view, there is much more going on. 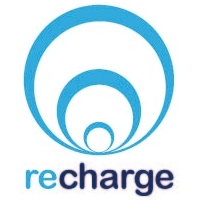 The basic technical set-up for a full ReCharge site includes at least one buffer battery, which connects up to four FCPs to the grid and to renewable energy sources in sight, and the ReCharge sign. The AwesomeMobilityChip, which comes with the component on the base of the car, the 'Comsock', can be used to speed up payment and through it all three spatial coordinates plus an extra tilt variable of the socket are located, in order to find the correct angular dimensions of the discs and its plug. While the FCP is still busy rotating itself into the right position, the user already choses for the amount he wants to charge, based on kWh, price, range or time. Doing so on the interface or cellphone is all there is left to do for the user. Once the FCP is safely connected to the car, the electricity transfer starts, drawing energy from the buffer battery, which optimally divides the charging capacity between all connected vehicles. In addition to the illumination of the discs, indicating their status, there is also the ReCharge sign, which extends that info by price per kWh and remaining time for each parking spot.